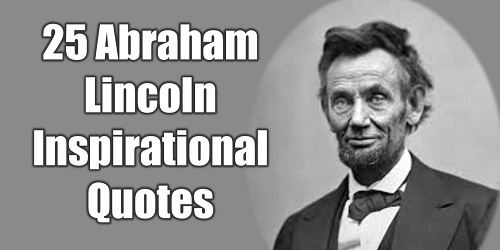 25 Abraham Lincoln Inspirational Quotes To Be A Great Leader - Motivate Amaze Be GREAT: The Motivation and Inspiration for Self-Improvement you need! The 16th President of The United States of American, Abraham Lincoln was one of the most iconic figure in world history. Often quoted because of his wisdom, his life accomplishments have no parallel. From leading the country in civil war, abolishing slavery, modernizing the economy and strengthening the federal govern. Lincoln's life struggles also are impressive, consider one of the most recognized underdogs that made it big: "Way before presidency, Lincoln tried to succeed in business with 2 ventures with no success. When he was about to get married his fiance died. He lost 8 times in different elections. Meanwhile, he dad a nervous breakdown". The meaning behind the quote: What you do with your time is what matters, the time you do it is pointless if you do too little. You have 24 hours a day, prioritize what it's most important. Get it done. Move the next day, do it again. The meaning behind the quote: We can control our feelings, they are connected to our own actions. Don't leave it to randomness. The meaning behind the quote: Better do little well and learn, than to do big wrong and have no growth whatsoever. The meaning behind the quote: Elaborate a good strategy, but execute it with full effort and belief! Cause that's the only way it will work. The meaning behind the quote: Happiness is not a goal, is a way of living. You can be happy if you want to, right now. See the beauty in anything, look at the positive side, count your blessings. The meaning behind the quote: In adversity, all we have to do is fight and overcome, your on your own. With leadership we have to make decisions, not solely for us, but that will affect others. This is when character appears, you can choose to have all for yourself being selfish, or, to share and help others, being unselfish. The meaning behind the quote: This quote is a mention to slavery. It makes no sense for men to imprison their own kind. The meaning behind the quote: Pictures are a portrait of reality. We can't always be beautiful, because life isn't always beautiful, no need to fake it. The first step to make things right, is to see the wrong in them so you can correct it. The meaning behind the quote: This is kind of a wordplay. A two-faced person is a person that tells you something but makes the opposite on your back. Lincoln is joking when being accused of being a two-faced person, by making fun of his ugly face using irony. The meaning behind the quote: If enemy and friend are opposites, I guess yes! The meaning behind the quote: You cannot being counting on a divine intervention if you don't do your part. First plant the seed, don't worry who makes the tree grow, he will do it if you plant the seed, trust. The meaning behind the quote: You can choose to be a pessimist or an optimist in life, it's up to you to decide. The meaning behind the quote: The truth will always find a way to come to surface. While a lie has no legs. The meaning behind the quote: Be responsible for your own acts. Choose to do your own obligations and you'll be fine. The meaning behind the quote: A friend is a person that opens your mind and takes it to new heights, like the information you can get by reading a great book. The meaning behind the quote: Ever hear about having and accountability partner? This what this quote refers to, a person who helps you to keep your commitment to reach a goal. The meaning behind the quote: No one has the right to criticize others, if they never walked in their shoes. The meaning behind the quote: Don't judge a book by its cover, open the book, get to know the person well before you judge solely on appearance. The meaning behind the quote: Great analogy. Again get to know people better, their core values. before making judgments on the way they appear to be. Also, don't worry about your own reputation, work on your character because that's what makes a difference. The meaning behind the quote: You want to gain respect from others, star to respect others and be true to yourself. The quote is about a country but it can be used to portrait anyone and their obligations. The meaning behind the quote: There is plenty of written information about almost everything in this world, search for the information. Be self-assured be reading it. The meaning behind the quote: You did everything you could do? Hold on, a change is coming, but you must hold on and keep going, although you're tired and seems hard to find the strength to carry on. The meaning behind the quote: Have your priorities in check. You must prioritize and sacrifice what is stopping you, if you want to succeed. The meaning behind the quote: I doesn't matter who you are or where you at, as long as you make a full effort to be great doing what you do you'll succeed.